Lt. Welles: [the pilot Lt. Welles in the helicopter full of soldiers talks over the radio] Whiskey 1-2. Whiskey 1-2, do you copy? Going 180, close the distance, get back in contact! Lt. Welles: [when the helicopter is shot at from below and starts to go down] Have faith, guys. I've gotten us through a lot more than some light turbulence. Had heard nothing but great things about 'The Walking Dead' from friends and IMDb reviewers. It took a while to get round to watching, both from being busy and also not being sure whether it would be my cup of tea. Finally getting round to it a few years ago and slowly working my way through it, having had a very long to watch and review list, 'The Walking Dead' turned out to be very much my cup of tea and as good as the hype made it out to be, have found it extremely addictive. "Walk with Me" is another terrific episode to Season 3, after a hugely promising start to the season. Not as good as the brilliant first two episodes, but it is a very successful attempt at a change of pace without being too out of character for the show. And a strong reminder of how Seasons 1-5 of 'The Walking Dead' to me were absolutely brilliant and seeing the show in its full glory days (Season 6 was uneven, Season 7 was a huge disappointment and am still debating whether to watch Season 8). It is as emotional, complex and as tense as one would expect, at the same time it has adrenaline and guts. It still shocks me at how an intelligent, well-made (so much so that it is easy to mistake it for a film) show about zombies could be made when so many films have tried and failed abysmally to do so. My only complaint of "Walk with Me" is that at times it is a little too heavy on the talk in a relatively light on action episode. Most of the gang here are missing here, with the episode centred around Andrea and Michonne, and as the characters missing here are generally more interesting they are missed. Luckily the story here is strong and engrossing enough, feeling like there is just about enough 'The Walking Dead' in there, and it was great to have Andrea and Michonne more interesting. Like all the episodes of the show, "Walk with Me" is incredibly well made in the production values, with gritty and audacious production design, photography of almost cinematic quality, effects that look good, have soul and are not overused or abused and pretty frightening make-up. The music is haunting and affecting, having presence but never being too intrusive. The writing generally is intelligent and thought-provoking, with lots of tension and emotional resonance and already showing signs of character complexity and multiple layer storytelling. The more eventful are thrilling and terrifying as well as uncompromising. Appreciated the ever strong and still progressing story and character building, which the episode has a bigger emphasis on, and that the pace is never dull or rushed, if not as taut or edge of your seat as the first two episode. The character writing and the character interactions are what is particularly great here, the most notable assets of the episode being with the introduction of the Governor (a wonderfully mysterious and already interesting character) and the re-appearance of Merle. Everything is nicely paced without rushing through the more important parts. The world building is already stunningly immersive and effective. Direction is smart and atmospheric while the show throughout has been strongly acted. 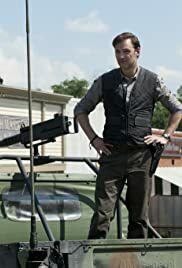 Michael Rooker and David Morrissey (making his debuting appearance as the Governor) are especially good, and Laurie Holden holds her own.